Take on the role of Monkey, a strong and athletic, yet solitary figure, who been captured by one of the mysterious slave ships, which harvest the remaining population and take them out west never to return. Trip, a technologically savvy young woman who has also been imprisoned by the same ship, manages to escape. She quickly realizes that Monkey, with his raw strength and power, is her only hope to survive the perilous journey back to her home. She hacks into a slave headband and fits it on Monkey, linking them together – if she dies, he dies… Her journey has now become his and Monkey must now travel west alongside Trip as they traverse a demolished world, under constant threat of capture and mortal peril. Hello and Welcome to my ENSLAVED™: Odyssey to the West™ Premium Edition Complete Achievement Guide. Here I will be writing my views and general information regarding this game. If there are any errors or mistakes in this guide please inform me so that I can correct them and improve the guide. 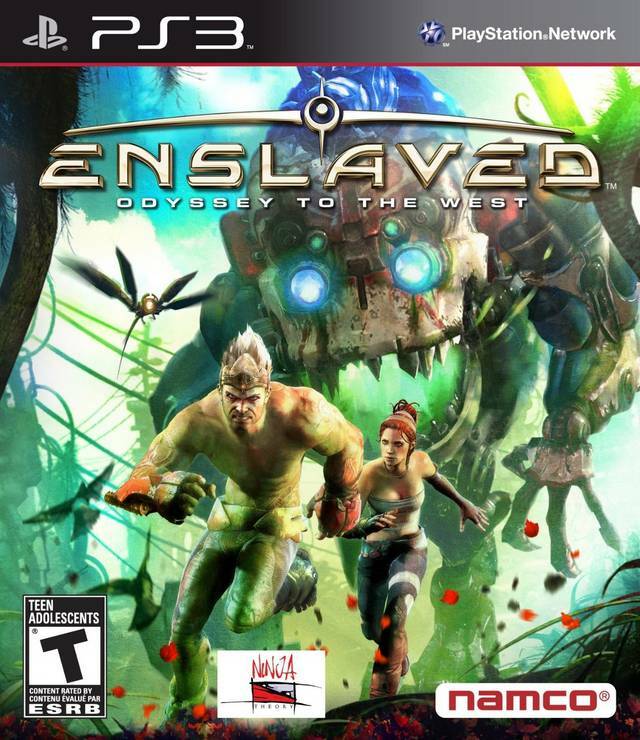 Enslaved is a fantastic game with a very unique, biopunk theme. But the game suffers from various bugs which make progressing through the game and obtaining achievements (One in particular) a bit hard. However, I found that the key to most of the bugs is playing the game with your overall graphic setting set to "Low". So playing the game with "Medium" or "High" settings should keep you away from most of the bugs. I have created this guide to earn all achievements in the main game through two playthroughs. First playthrough should be done in Easy difficulty. You can earn all except 4 achievements in the first playthrough. Second playthrough should be done in Hard difficulty. You can earn the other 3 achievements in the second playthrough. Please note that I have not included a guide to find all the Tech Orbs and Masks. Since there are many other detailed guides for this on Steam, I did not include a guide for this. But I have included my personal Save file in which I have collected all the Tech Orbs and Masks except 1 Orb and Mask in the final Chapter. This will allow you to gain both the achievements. The Save file and the location of the final Orb and Mask in the Save file can be found under their specific Achievement titles. This is the default save file location of ENSLAVED™: Odyssey to the West™ Premium Edition. There are a total of 12 upgrades in this category. You will need a total of 337,500 Tech Points to buy them all. There are a total of 6 upgrades in this category. You will need a total of 247,500 Tech Points to buy them all. There are a total of 8 upgrades in this category. You will need a total of 237,500 Tech Points to buy them all. There are a total of 7 upgrades in this category. You will need a total of 390,000 Tech Points to buy them all. There are a total of 33 upgrades in the game. You will need a total of 1,212,500 Tech Points to buy them all. Even if you have collected all the Tech Orbs in you first playthrough, it would not be possible for you to get this amount of Tech Orbs. You can either do a second playthrough or beat Chapters with high amount of enemies (i.e. : Chapters 6 and 11) repeatedly to get Tech Orbs dropped from defeating mechs. Up on the Roof Complete Chapter 3. Caught a Show on Broadway Complete Chapter 4. Escaped New York Complete Chapter 5. A Bridge Too Far Complete Chapter 6. There You Are! Complete Chapter 7. Windy Passage Complete Chapter 8. To Meet a Pig Complete Chapter 9. What a Pig Complete Chapter 10. Swine Flew Complete Chapter 11. Anchors Away! Complete Chapter 13. Smoky Bacon Complete Chapter 14. Freed The Slaves Free the slaves. Got Your Back Rescue Trip 3 times after she has performed an EMP. Early in Chapter 2 (Automatically triggered). After you disable the turret let the incoming mechs go to her (Chapter 2). There are some other instances as well, but you can get this very easily. Simply restart the Checkpoint after she introduces the EMP midway through Chapter 2. Do this till you get the achievement. Bad Doggy Rescue Trip from the Dog in less than 36 seconds. This achievement can be earned in Chapter 9. This is a bit of a hard achievement. Especially if you’re planning on collecting all the Tech Orbs in this Chapter. First, instead of collecting orbs and getting the achievement, familiarize yourself with the track. You will have to go through every speed boost if you want to get this achievement. Since you may have to replay this part a couple of times, I suggest creating a backup save right at the moment you start the chase. This way, if you fail to get the achievement, you won’t have to play the whole chapter again. The achievement should pop up just when the end cutscene starts. If it doesn’t, load your backed-up save file and start from the chase again. Playing the Chapter on easy mode help a lot to get this achievement. For those who are planning to collect all the Tech Orbs in this Chapter, you may have to play this 3 times. First time is to get this achievement. After you got that, load up your backed-up save and start at the chase again. This second time is to collect the most common orbs you can find. After you got that, you will have to start the whole chapter again (Do not load the backed-up save this time since it will wipe out the common Orbs you found while you played for the second time.). This third and final time is to find all the uncommon or hard-to-reach Orbs you couldn’t get the previous time. You Swine Beat Pigsy to the top of the Decaying Titan. This race happens early in the Chapter 10. This might be bit of a close call and you may have to try this multiple times. Familiarizing yourself with the environment during this race really helps. If you’re planning to collect all the tech orbs, you will have to play this race two times. First, get the achievement. Then restart from the checkpoint and collect all the Orbs. Matador Kill the Rhino without getting hit by his Charge Attack. You will face the Rhino at the end of Chapter 11. You simply have to roll sideways when the Rhino is charging at you. Keep running in circles to easily avoid its Charge attack. You can utilize your Cloud during this sequence too. If it hits you with its Charge attack, restart from the last checkpoint and you will still get this achievement. You will still get the achievement if you get hit by its Stomp attack. Just be mindful of its Charge while you’re aiming your staff to shoot the bombs and fuel cells. Got the Horn Rescue Trip from the Rhino in less than 35 seconds. This is another chase sequence like in Chapter 9. Again, familiarize yourself with the track. You will have to go through every speed boost and do not stray away from the track. Even for a little bit. Much like in the “Bad Doggy” achievement, I suggest creating a backup save when the chase starts since you won’t have to play the whole Chapter if you fail. The achievement should pop up just when the end cutscene starts. If it doesn’t, load your backed-up save file and start from the chase again. Just like before, playing the Chapter on easy mode help a lot to get this achievement. If you’re planning to collect all the Tech Orbs in this Chapter, you may have to play this 3 times. Exactly like I have described in the “Bad Doggy” achievement. Dinner Date Pigsy's Perfect 10: Collect all hidden food and pin-up girls. Use your Green Lens excessively in every area. Most of them can be found this way. Food and Pin-ups are show in a much darker shade when you use the Lens. There are a few Food and Pin-ups in certain Chapters that you may have go back to collect again if you die. You can see your Pin-up and Food progress in the Chapter Select. Below here is the guide to find all the hidden Food and Pin-up Girls. Pin-up: After using the grapple for the first time, turn around and the Pin-up is to the left of the gap you climbed up. (This is just after the sniper rifle training). Food: Soon after you get the Pin-up, you will learn how to drop down. The camera will shift to look at a grapple to the far left; the Food is at the end of the platform that you are on when the camera shifts, before you grapple across. Food: You should reach a platform when Pigsy says something like “This used to be the biggest mech in town”. Behind a wall on the right side is a Food. Food: As you climb the mech you should fight a single enemy then a group of two. Use three more grapple points and then the camera suddenly shifts behind the platform. The Food blends well with the scenery and is easy to miss. Food: After the cutscene showing you get the first piece (an achievement should pop) go down twice and descend using the grapple. The Food is just behind you. Pin-up: After the previous Food, grapple down once more and it is in the corner opposite the exit. (Just before the Pigsy Prod tutorial). Food: Once you get past the turret and grapple down, look behind you for a grapple point. The Food is on that platform. Food: You will get to an area with 2 shooting mechs and 3 melee mechs. If you climb up to the vantage point like the game says, you will have to grapple down a wall to a platform below the mechs. It is on the platform next to where you land. Food: Once you have defeated all the 2 shooting mechs and three melee mechs in the next area, before you leave through the red-leaved pathway there is a grapple point behind you. Food: There will be a grapple point that you have to shoot to be able to use. Shoot it three times then grapple down on it, and the Food is just off to the left. Pin-up: Drop down from the platform with the Food on above and move towards the camera to find a little secret area with a Pin-up. Pin-up: Sneak past the turret, then past the next 4 mechs to a grapple point. Sneak past the two shooting mechs here, enter the building and look to your right for the Pin-up. Food: Drop down the grapple point in this same room and look behind you, it’s in the corner. Food: As soon as you start, kill the mechs and go along the path behind you, it is at the end of it. Food: After killing the mechs in the area you will come to the entrance of a pipe. Before entering, look to the right hand side of the pipe entrance. Food: Enter the pipe and go to the right. Pin-up: Kill the mechs after exiting the pipe and grapple to the top of that building. Climb down a level and go to the right instead of continuing left to find this Pin-up. Food: Keep going until Pigsy says that the scrap processing plant is around the corner. There is a little wall on the left that the Food is behind. Pin-up: After passing the turret and grappling up a few levels you will see more mechs. To the left of the first group is a Pin-up. It is difficult to get to so I would suggest using an EMP or Distract device on them. Food: Again, there is a path behind you that leads to another Food package. Food: Drop down from the first area after you used Ally device on the turret and in a pipe behind you is another Food package. Food: Go over the bridge that is just beyond the turret's reach and the package is around the corner on the left. Food: Continue on for a while and you will reach a large group if enemies with one Electric mech. Kill all of the mechs in this area, pull a lever and drop down. Got towards the camera at the end of the walkway instead of continuing forward. Important: If you start the level refinery and die you need to go back to collect the last Food in Organized Chaos. Pin-up: Kill the mechs in the starting area and grapple up to the walkway on the left. Follow it around to find the Pin-up. Pin-up: This Pin-up is just beyond the column that you have to destroy that is just in front of you at the start. You need to destroy the turret first to make things easier. Food: Destroy the turret, grapple to the island it was on and then climb up the pipe walkway. Few mechs will appear. Kill them, and just beyond the first semi-circle of cover is the Food. Food: As soon as you see the Chapter name pop up (mid-gameplay) look to your right to see a metal grate that you can blast through using a Bomb device. Food: Back on the main path and just around the corner is the next Food. It is in the bushes next to the slimy water. Food: Keep following the main path and it should branch off to the right on platforms across the slimy water. Before you cross the river, carry straight on and jump over a metal bar to find a Food. Food: After climbing and descending on the main path for a while, you should come to a metal platform in the middle of a swampy area. The main path branches to the right, but the Food is straight ahead. Difficult to miss. Pin-up: After the previous platform you will jump across sinking platforms and grapple through a window. The Pin-up is on the left, behind the camera. Important: If you die at the turret just ahead you will need to go back and collect the Pin-up again. Pin-up: When the chapter starts look behind you. It’s on the side of the small square container. Food: After opening the door to escape the dog mech, the Food is just in the corner, easily visible on the main path. Food: After grappling off the raft, the platform will start to collapse, but don't grapple onwards, instead go backwards on the path. It blends into the scenery, even while using the Green Lens. Food: After you kill two shooting mechs in the main path, go away from the camera behind the wall and drop down to find some Food. Food: Follow the path round a bit further and there will be a wall of rubble to your left. Go around it and its just on the floor (the platform this is on has small blue strips on it). Pin-up: Drop down two levels until you are on a ledge with a lever and door on it. Follow it around all the way to find a Pin-up on the wall. Food: When you see a container and a fan (after the lift area) you will see a turret ahead. Stun it, and then blow it up. Blow up the fan behind it and there's a Food round the corner. Pin-up: Shoot the box to disable the electricity, kill the mech and then the shooting mech in the distance. There is then a T-junction in the path. Follow it left to find the Pin-up.